The Light L16 is one of the first “computational” cameras to hit the market. If it works it’s a game changer for high resolution and lightweight photography. Especially for hikers, backpackers, outdoor adventures, travelers or anybody that needs a light, pocketable camera that can produce a 52 megapixel image! And it has the promise of not needing to be traditionally focused. That is, you can determine where and how you want to focus a photo AFTER you take it. So how does the L16 hold up to the hype and high expectations? The Light L16 is much smaller and lighter than a conventional camera that takes a 50 megapixel photo. And it has a simple smartphone-like interface—not so surprising since it is an Android-based, touchscreen device. This make the L16 much faster and easier to learn and use than all the knobs, dials and nested menus on a conventional camera. The Light L16 is a completely new approach to high-resolution photography. It’s a computational camera. 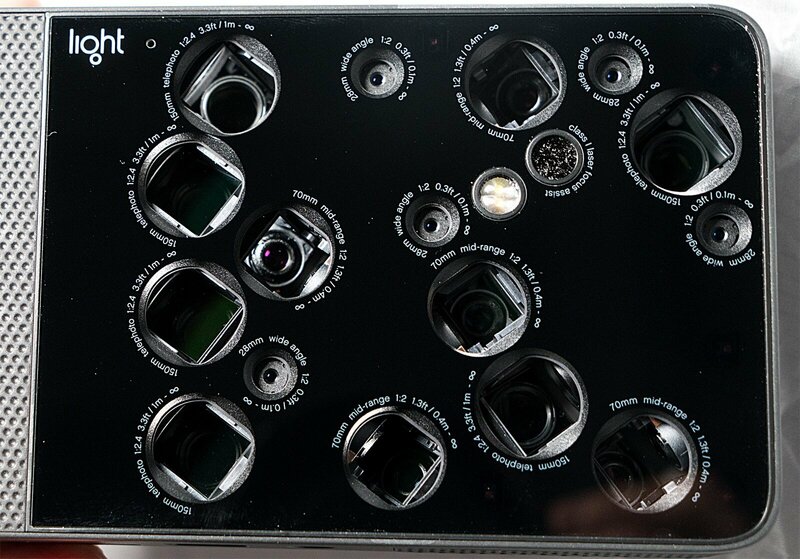 That is, a camera that combines the information from many small, inexpensive “smartphone” lenses/sensors, arrayed across the front of the camera like spider eyes, into a single high resolution image. This is done by sophisticated, “computational,” imaging software that merges the data from the camera’s 16 lenses of different focal lengths (wide angle, normal/portrait, and telephoto lenses) into a single photograph. The Light L16 is exceptionally small and low-weight for a 52 megapixel zoom camera. It looks more like a slim smartphone vs. a bulky, awkwardly shaped, conventional camera with a big lens sticking out. It’s half the weight of the lightest comparable conventional cameras with similar resolution and lens zoom range (28mm to 150mm). Last week I got a few hours of hands on use with the new Light L16 camera. Here’s my take after using the camera, looking at it’s post processing software and talking with a some of Light’s technical staff. Note: This was a short time. Some of it in a controlled environment, although I did get some time to wander around New York City at night with the camera and do some street shooting. Fun! No moving parts. Fewer failure modes, limited area for dust and water entry. Can adjust depth of field AFTER taking the shot. Light says that “Adjust focal plane [the actual place of focus in the photo],” is coming in the next release of Lumen software—maybe a week away. This will be a game changer! 5x “optical” zoom. 28mm to 150mm zoom range (35mm equivalent). This is done with multiple 28mm, 70mm and 150mm fixed lenses arrayed on the front of the camera. Simple smartphone like interface with touchscreen operation. Fast to learn and use. Frequent software upgrades vs. a conventional camera. The Light L16 looks more like a slim smartphone vs. a bulky, awkwardly shaped, conventional camera with a big lens sticking out. At 15 oz it’s half the weight of the lightest comparable conventional cameras with similar resolution and lens zoom range (28mm to 150mm). It has no moving parts, which means far fewer failure modes and limited area for dust and water entry. Full 52 megapixel resolution is only at a few focal lengths. The L16’s “variable resolution” is lower than 52 megapixels at other focal lengths. So the L16 is not quite the same as a fully optical 28-150mm zoom on a conventional camera which has fairly consistent resolution across most of it focal range. According to Light ‘The “ideal” focal lengths to shoot at for maximum size and quality across the entire image are 35mm or 75mm.’ On the bright side, these are respectively excellent focal lengths for landscape and portrait work. Low light, high ISO performance not there yet. Light suggests a maximum working ISO of 800. This makes some sense with the small size of its smartphone sensors. Altho over time Light may be able improve upon this with software. That is, combining/processing the information from all the sensors to reduce noise and improve ISO. After all the sum of the combined area (10) 13 megapixel sensors is the equivalent of a much larger sensor. The following two above likely limit the camera to tripod only use in low light, including the “golden hour” favored by photographers. Dynamic range 1 to 2 stops less than competitive conventional digital cameras like the Sony a6500 (claimed by a Light tech rep. to be in the range of 13 stops). This makes sense due to the small size of smartphone image sensors. Again Light.co believes they the can improve upon this via software for reasons similar to the ISO bullet point above. No replaceable memory storage, e.g SD cards. Instead has 256 gb of permanent internal memory. No smart focus, e.g. the camera making an intelligent focus point choice using hundreds of points across the image. Instead, you manually touch the screen where you want focus. If not the camera defaults to focusing on the center of the screen. Focusing can be slow at times. No exposure bracketing, HDR modes, or similar exposure management features. No remote control operation, e.g. remote shutter release to avoid camera shake shooting from a tripod. Camera is always at full aperture. Without ND filters it will be difficult to get long exposures necessary for blurred images, e.g. flowing water. Built in, non-replaceable battery claimed to get about 500 shots. So you either need to shoot with it tethered to an external USB battery. Or wait 1-3 hours to recharge and use it again. Charging takes 1-2 hours with the Li16’s 15 volt charger, or a 2-3 hours with a conventional USB power source/charger. No lens hood/shades available. No way to mount specialized filters like neutral density or polarizing. It has no viewfinder. So, like a smartphone the display can be hard to see in bright light. AS of right now the Light L16 has the basic functionality of high resolution camera. In good light and at certain focal lengths, it takes high resolution, ~50 megapixel photos. It’s small, light and easy to use with it’s simple smartphone-like interface. There are no moving parts or items sticking out making it ideal for people on the go (like hikers , backpackers, travelers and outdoor adventurers of any ilk). Just pull it out of your pocket and take good, high resolution photos. And it offers truly new features like adjusting depth of field after you take the picture (and hopefully, in the near future, the ability to adjust focus point after you take a photo). In all, it’s an extremely attractive camera that’s half the weight and far easier to use than a conventional camera! And to be truthful this is how I would normally take a serious photo about 80% of the time anyway. Where the Light.c0 L16 falls short is that it lacks many of the features and nuances of conventional single lens/sensor digital cameras in the same price range. That’s not surprising, since conventional, single-lens digital cameras have been constantly refined and improved for over 40 years (“first” digital camera was a 1975 Kodak prototype by engineer Steven Sasson). The Light L16 has only been in design/development for a few years and in production for a few months. As such, the Light L16 lacks image stabilization, good low light performance (high ISO), multi-zone exposure metering, smart focusing, exposure bracketing, remote shutter release, lens hoods, and a number of other features that are pretty much standard on conventional, high-resolution cameras for serious photography that are in the same price range. Some features like smart focusing, good low light performance, exposure bracketing, and remote control can likely be improved upon or added via software upgrades— a clear benefit of being computational. Other physical features like image stabilization, a non-replaceable battery, non-replaceable memory (e.g. SD cards), and lack of filters and lens hoods will be harder to address (altho third parties could make aftermarket solutions for some, similar to what has happened for smartphones). I wish Light all the best in quickly addressing many of these issues I and others have raised, to make the L16 the game changing camera it could be. And if it isn’t the L16 v01, it will be v02 or another computational camera. When you reflect on the improvements to conventional digital cameras over 40 years… just think of what 5 to 10 years of development and refinement of computational photography might achieve! Shutter speed: 1/8000 to 15 sec. Fastest shutter speed 1/8000 Slowest shutter speed 15 sec. I find it concerning that, for $2k, I could get a camera that takes really good pictures when displayed at small sizes, but fails when printed at large scales. For that, I already have a phone. I’m unsure what space the Light would fill. After seeing this on a camera blog years ago I had completely forgotten about this thing. I thought it sounded gimmicky but your post makes me want to give it a different look. I wonder what the perceptual megapixels will be like given the small area of the lenses and sensors. The 100% crops on their site look insane, though! Do you think you may pull the trigger on one? Where it needs improvement is in the area of noise, high ISO performance, color saturation, and dynamic range, etc. That is to make those 52 megapixels look as good as possible. Or put another way, 24 well exposed, low noise, and nicely color saturated megapixels are going to look waaay better than 52 that are not. All these challenges stem from the small 13 mp smartphone sensors which I am guessing are 1/3″ or 1/3.6″ If my math is right, even 10 of these combined do not equal the area of a crop format sensor on a camera like the Sony a6500. As such, Light.co has their work cut out for them to do the absolute best to computational processing the sensor image infomation to be waay better than a smartphone photo and hopefully approach the image quality of a crop format camera. > Do you think you may pull the trigger on one? I’ll let you know my thoughts if I pick one up. Thanks again for bringing this back to my attention.